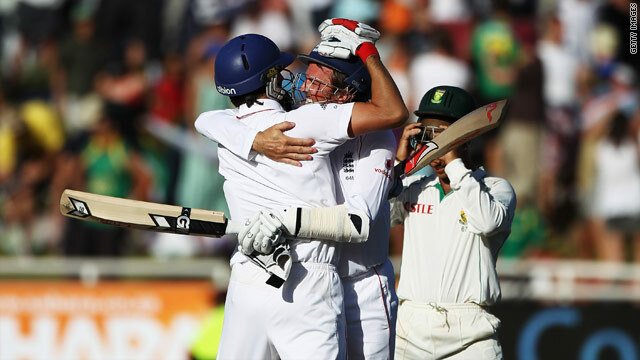 England tail-enders Graham Onions and Graeme Swann celebrate England holding-on to claim a last-gasp draw againt South Africa. (CNN) -- England cannot lose their series against South Africa after Graham Onions relived his Centurion heroics to cling on for yet another draw in the third Test on Wednesday. Newlands, Cape Town, was the venue this time as number 11 Onions again blocked out the final over, with the added prize for his second act of defiance this winter being the retention of a 1-0 lead with only one match to play. It seemed the late twist would not be required while Ian Bell (78) and Paul Collingwood were shutting the hosts out for 57 overs in a sixth-wicket stand of 112. But Collingwood and Matt Prior fell in successive overs from part-time off-spinner JP Duminy and, after Stuart Broad had gloved one to short-leg off Paul Harris, Bell fenced a catch behind to Morne Morkel to be ninth out with 17 balls left. It fell to Morkel to deliver the final six balls at Onions, but he could not shift him. England therefore closed on 296 for nine, reprising the survival acts of both Centurion last month and Cardiff in the Ashes five months previously. For South Africa, a failure to take more than six wickets on the last day was a demoralising outcome. A team ranked the best in the world until last month must now accept a drawn series is the limit of their ambitions for next week's fourth and final Test in Johannesburg. Set a world-record 466 to win, England knew at the start of play the best they could possibly hope for was a hard-fought stalemate. After the morning departures of James Anderson and Jonathan Trott, their last two specialist batsmen were all determination -- and had to be when South Africa took the second new ball at 180 for five straight after lunch. Bell kept out 212 balls in all and Collingwood, a stalwart of both England's 2009 rearguards was equally defiant in his knock of 40. But after Collingwood finally edged to slip off Duminy and then Prior poked one off the face of the bat to be very well held by AB de Villiers at short leg in the same bowler's next over, South Africa had another chance in the evening sunshine. However, ulitmately they could not shift the stubborn Onions, prompting wild scenes of celebration in the England camp.